This is why I love my wife. This past weekend, Carla and I did some major shopping. In general, we both hate shopping, so this had the potential to be a large-scale disaster. However, the day turned out to be both enjoyable and productive. We headed back to our old neighborhood in the city and spent the morning and early afternoon walking up and down the main street, stopping in multiple shops to try and finish up as many presents as we could for our nephews and niece. As we were walking past an antique furniture store, we passed a small, old, yellow stool. As soon as we walked by it, it caught my eye. I pulled Carla back and told her how cute I thought it would be in our nursery. She agreed, we stared at it for awhile and then headed into the next store. In the next store, we found a few things we decided to buy. We are putting together a photo frame collage of family photographs in our stairwell and we found two picture frames that we thought would be perfect. I was finished up paying for the picture frames and Carla headed outside with the rest of our bags. As soon as I finished paying, I walked outside to find Carla and didn't see her anywhere. I looked up and down the street and decided to check in the antique furniture store we had passed. I walked inside and saw her right away. She was at the counter, buying me my stool. She had this huge smile on her face and it immediately melted my heart. Carla told me that when I pointed out the stool, she was able to picture our child sitting on it, reading a book and she knew we needed to have it. There are so many reasons that I love Carla, but this is just such a perfect example of the kindness that is in her heart. Every time I look at my little, yellow stool I will remember just how much I am loved and just how much Carla will love our child one day. 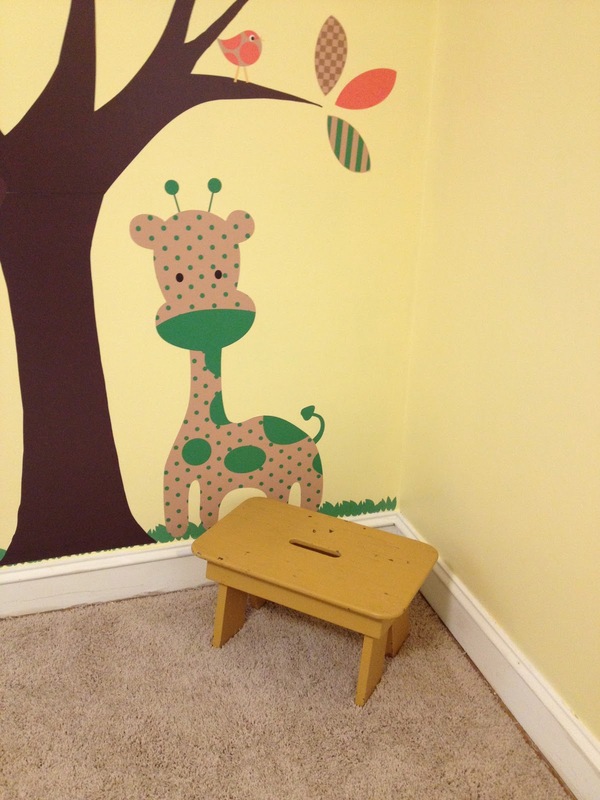 We walked the stool back to the car and as soon as we got home, the stool found its place in our nursery. And there it will wait, until one day there is a child there to sit on it and read a book. When Carla and I first got on the adoption wait list, Carla came up with a brilliant idea to help make the waiting just a tiny bit more manageable. 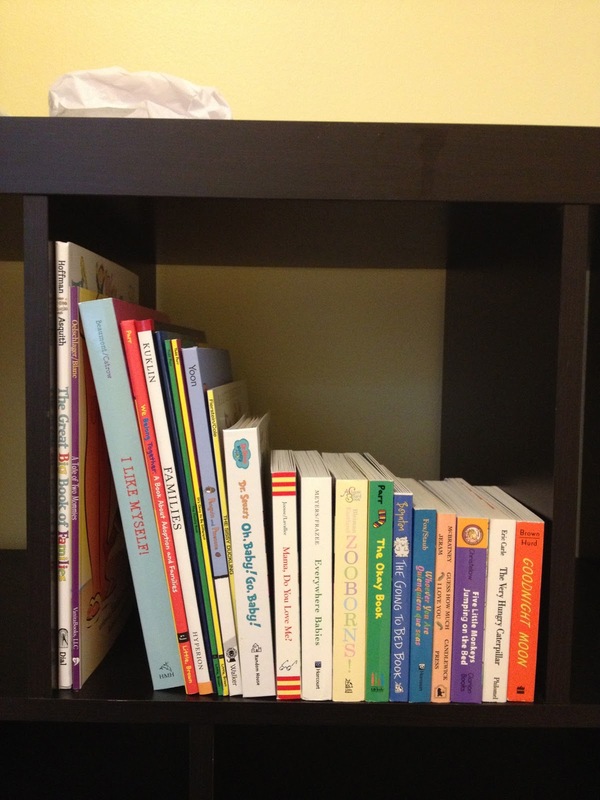 Each month that we were on the wait list, we would each pick out one book for our one-day child. That way, we would be able to grow our child's library while we waited for our child to find us. The very day we got on the wait list, we went and bought our first books. I wrote about those first books in another blog post, but I thought I would review the first books and the ones that have come since then. We ended up with two Todd Parr books (he is one of my favorite authors and writes a lot about family diversity and being proud of who you are). Carla bought her very favorite book from childhood, The Very Hungry Caterpillar and the book Mama, Do You Love Me? 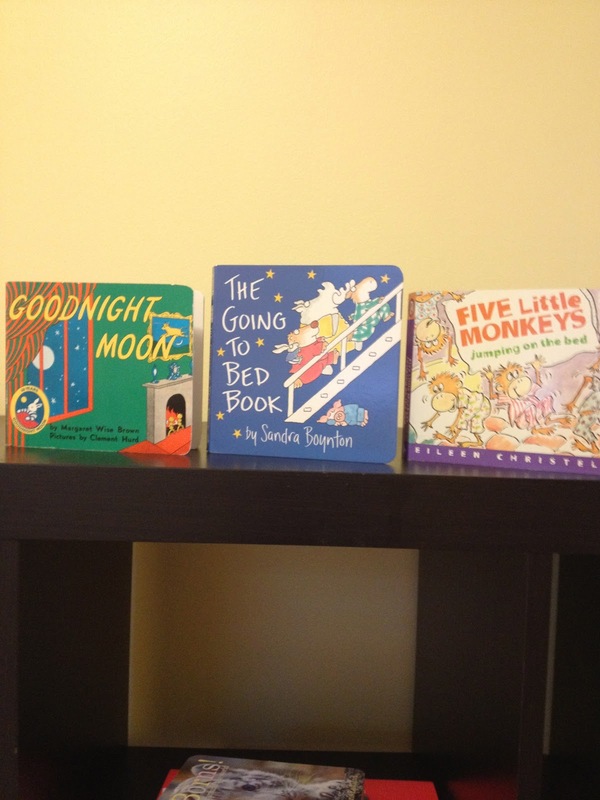 It was a wonderful start to our book collection. Both of these books speak to our family and I can't help but feel incredibly thankful that there are books in today's world that will allow our child to see himself or herself reflected in the books that we read together. I wish there had been books like these when I was a kid. I wish that I had the chance to see myself reflected in this way in the books I read, but all I can do is feel grateful to live in a world where these types of books are becoming more and more common. 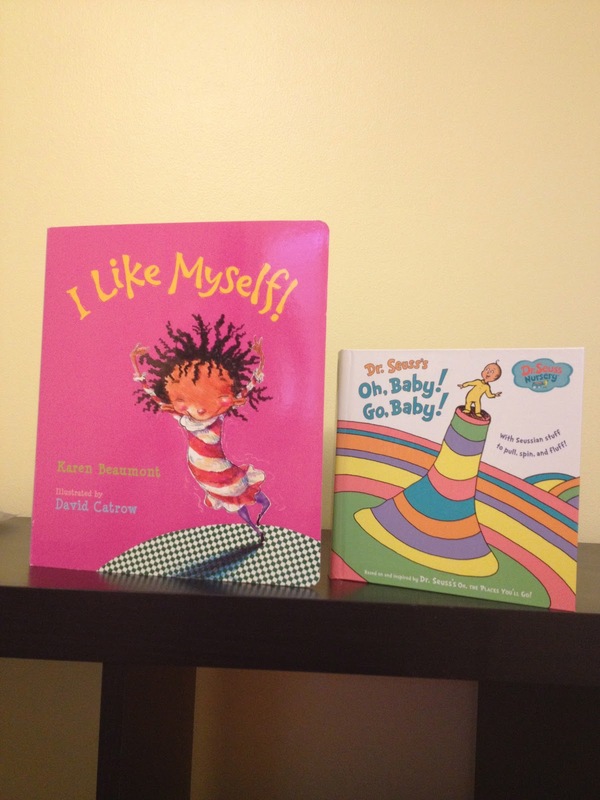 My choice was a baby's version of one of my all time favorite books, Oh! The Places You'll Go! It is called, Oh, Baby! Go, Baby! 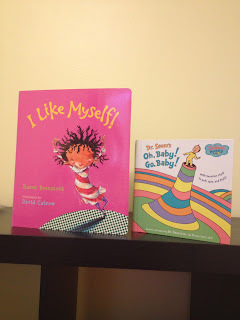 Carla's choice was I Like Myself! 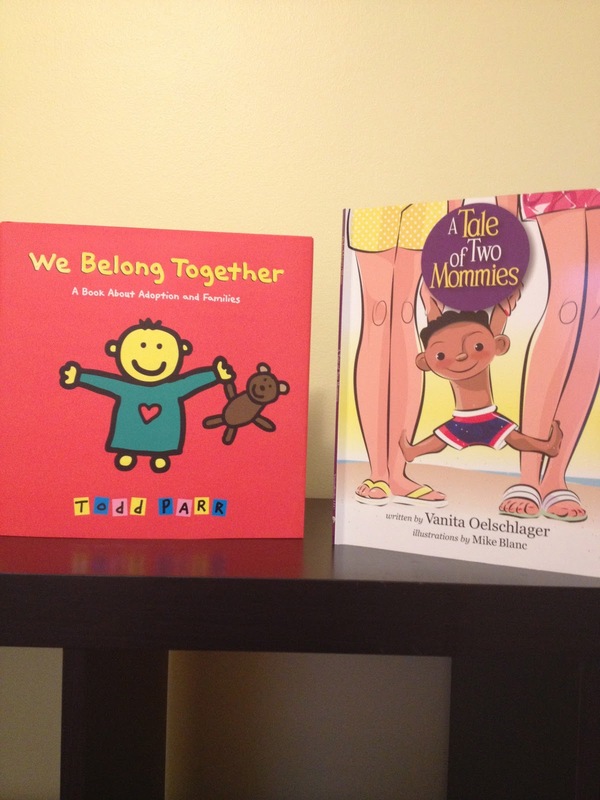 Two great books for the little one. My book was a recommendation from a blog reader. Everywhere Babies is such a great book and I was so glad that the title was recommended to us. Again, the book has wonderful representation of all sorts of families and all sorts of babies. I absolutely fell in love with it as soon as I opened it. Carla's choice was Zoo Borns! It is such a Carla book! It is filled with adorable pictures of brand new baby animals of all kinds. Carla is hoping to start our child's love of animals and nature early on in life. The last book, Penguin and Pinecone was too cute to pass up. The final moral of the book is, "If you give love, it grows." I loved everything about the book and couldn't leave it behind. I love the idea that one day, we will be able to look at these inscriptions with our child and talk about the tradition of book buying that started while we were waiting for our child to find us. 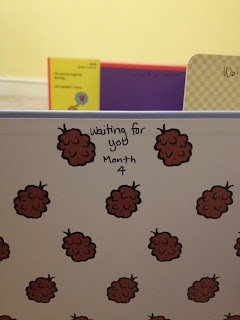 Each book got labeled "Waiting for you month __." These books will make a wonderful timeline of our wait and one day we will be able to show our child just how excited we were for him/her to find us. I love knowing that our collection is going to keep growing. 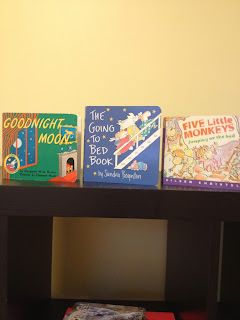 And even better, I love knowing that one day these are the books that we will be able to read together with our child as a family. Yesterday was truly the best Thanksgiving I have ever had. This year, Carla and I hosted both of our families at our house. Carla was amazing! Carla loves a holiday and she loves to cook. So once it was decided that Thanksgiving was going to be at our house this year, she kicked it into high gear! There were lists, there was a timeline, there were recipes saved on the computer, it was incredible. And everything turned out so beautifully. I was beyond impressed and beyond thankful. So yesterday afternoon, my family and a portion of Carla's family all sat around our dining room table. As I looked around the table, all I could feel was thankful. And I couldn't help but think about the past year. Yes, I have struggled through the adoption process. Yes, my dad was sick. Yes, we lost beloved family members. But none of that is what I thought about. Instead, I thought about how lucky I am that my incredible father battled his way back from such illness and is now in a wonderfully healthy place and is able to enjoy life and enjoy our family and be there for all of our celebrations. I thought about how lucky I am that I have the most wonderful and supportive family, with an adorable little nephew who entertained all of us until he passed out asleep upstairs from too much fun. I thought about how lucky I am to have a mother who has been exhausted beyond belief by the year that has passed, but somehow finds a way to keep being there for the rest of us and found a way to get herself to Thanksgiving lunch with a smile on her face and love to give to everyone. I thought about how lucky I am to have a sister that is also a best friend and who provides me with immeasurable support and love. I thought about how lucky I am to be able to host our family, in our home that I am so proud of. I thought about how incredibly lucky I am to have married a woman who will stay up until midnight after working a full day and then get up at 6:00 the next morning just to make us all a Thanksgiving meal filled with an incredible amount of love. I thought about how lucky I am that one day, hopefully in the not too distant future, I will be able to be a mom with this incredible woman to an incredible child and we will get to spend all of our future Thanksgivings together as a family of three. And then I just felt really lucky. While things have been, and will continue to be, hard, I am so lucky. There is so much in my life to be Thankful for and I was reminded of all of it yesterday. And when I woke up this morning, there were all the leftovers. Yes, there is a fridge full of leftover stuffing, turkey, potatoes, and pie, but there are also these leftover feelings of gratitude deep in my heart. Clearly, I have a bit of free time. Two blog posts in two days. In an attempt to procrastinate writing the rest of my report cards, I thought I would give everyone a small update. Small, because not much has happened since the last time we were presented. However, on Monday, two adoption related things did happen. First of all, we had to have another home visit. Every six months, someone from our adoption agency has to come out and check out our house (mostly just check to see if our fire detectors still work) in order to keep up our DCFS licensing. It used to be that these home visits totally freaked me out. I would worry about if the dog would behave (she rarely does) and I would worry about if the house was clean enough (it rarely isn't). However, like everything else in this process, we are starting to get used to the home visits. They no longer hold the same kind of power that they used to. They no longer inspire fear in me. They do inspire me to clean the house (which was handy since we are having Thanksgiving at our house this year) and they do inspire us to stock up on chewy things to keep the dog occupied. All went well. The home visit itself only took a few minutes and it was done. Fire detectors work. The house is still well-suited to raise a child in. Our pets are still overly friendly to all who enter our home. So now we have another six months until we have to do another home visit. That means another six months until the basement floors get a good mopping! In addition to the home visit on Monday, we also met our new adoption counselor. The counselor who has been with us since the beginning of our work with our agency has been reassigned to a different department. She will now be working on the post-adoption side of things. So on Monday, she came to our house with our new adoption counselor who seems very nice. While I have not always seen eye-to-eye with our first adoption counselor, it was a little sad to leave the comfort that we had established with her. I am sure that we will attain that level of comfort with our new counselor, but I also know that it will take some time. One of the nicest things about the meeting was that we got a chance to hear from our first adoption counselor how much she really liked us. I often wondered what she really thought of us, because she is a hard lady to read. But, it was really nice to hear the things that she told our new counselor about the kind of couple that we are. So now, I look forward to working with our new counselor and hope that she will be the one that is with us until the end. So that is it. That's the only update that we have for now. It has actually been really nice to not have a lot of activity right now. It has been nice to return to the normal kind of waiting. It has been nice to be able to return to the kind of waiting that allows you to almost forget, though not entirely, that you are waiting. It is nice to have a chance to focus instead on cooking Thanksgiving lunch, which is an entirely different kind of challenging. I am a stuffer. No, not the kleenex in your bra kind of stuffer. A feelings stuffer. I am getting much better as my life goes on, but from a very early age I was a stuffer of my feelings. I would pretend that everything was fine, until it built up to a point where I couldn't take it anymore, and then I exploded. People usually couldn't see it coming, but when it happened, there was no mistaking it. It is only recently, perhaps starting with my coming out, that I have learned to be honest with people about what I am feeling. It is still not easy for me, hence this blog, but I am learning to answer honestly when people ask me how I am doing. Because this is still a relatively new skill for me, I am still not quite used to always hearing people's reactions to my emotions and some people are still not used to hearing my honest emotions. But what I have loved most about this blog is that it is easy for me to share with people how I am feeling throughout this adoption process. From the safety of my own home, tucked away behind my computer, I can let everyone in my life know what I am really feeling without having to actually say it over and over again. It has been wonderful and really freeing. In many ways, it is the most emotionally honest I have ever been. However, opening myself up like that sometimes results in some messages that I am not always prepared to hear. Opening myself up and being completely honest invites the kind of advice that I spent much of my life shying away from. After the last few blog posts, I have received lots of advice. I am so touched that people care enough to want to reach out and am even more touched to know that there are people who are rooting for me throughout my life. What I know about advice is that it is always so well-intentioned. But what I also know about advice, is that it is sometimes hard to know the right kind of advice to offer. Over the past few months, I have heard one piece of advice over and over again. "Be positive. You have to stay positive." I have heard this more in the past few weeks ever since I entered my fairly significant slump. I completely understand why this advice is given and I have often given it myself to many people in similar emotional places. But for some reason, this piece of advice was upsetting to me in a very deep way. I couldn't figure it out for a long time. Why should this bother me? Why did I somewhat resent being told to stay positive? After a lot of thinking and talking, I have finally figured it out. I dislike being told to stay positive because I believe that I have never stopped being positive. That was it. It was the assumption that my sadness somehow automatically disqualified me from being positive. The truth is, my positivity is so much bigger than my sadness. Let me try to explain. This road to adoption is filled with so many ups and downs. The downs are really hard, which makes sense because the ups are so very high. It hurts to fall from a place that high up. So when I hear a no, I am sad. I am disappointed. In some ways, I am even grieving. I grieve the loss of the idea that starts to take shape in my mind of our life with a child. Hearing no makes me sad in a way that I have never been before. But here's the thing, being sad doesn't mean that I don't think this is the right path for us. Being sad doesn't mean that I don't think that this will all work out when and how it is supposed to. Being sad doesn't mean that I think we should give up or that it is never going to happen. It is quite the opposite in fact. I believe with my whole heart that things WILL work out when they are supposed to. I believe with everything that I have in me that we WILL adopt a child. I believe with one hundred percent certainty that Carla and I will be mothers to, what I will believe to be, the most wonderful child in the world. All of the sadness that I have experienced has not changed any of that. That is how I remain positive. To be positive does not mean that I will never feel sad and never feel disappointed. It does not mean that I will never feel frustrated with our current situation. But it does mean that I do not want to give up and I do not want to change the course that we are on. This is what we have chosen to do and this is what I continue to believe is the right choice for us. So please know that I have not grown any less positive. Sadness does not equate with negativity. When I cry because things didn't work out the way I thought they might, I am not crying because I think things will never work out. I am crying for that moment. But I have never lost sight of the bigger picture. I can clearly see in my mind how it will look the day when things do work out how I want them to. And as long as I can still see that picture, I know that I am still thinking positively. And now, I hope that you all can see that as well. Today, I felt like a normal human being. It took a lot to get back to this point. Most of the work was done by the amazing people around me. The kindness that has come from friends, family, coworkers, my amazing wife, and even from strangers has been so overwhelmingly heartfelt, genuine and supportive. It is what has brought me back. The randomly kind flowers brought to me by a coworker, my wife cooking dinner on the nights when I was too overwhelmed to stop working even for a few minutes, a delicious plate of homemade cookies brought into work as a moral booster, friends sending emails insisting that I join them in something fun to take my mind off of sad things, friends sending texts knowing that I wasn't going to be able to respond. It has all been what has brought me back. Last week continued to be awful. I returned from Florida and simply was not able to pull myself out of things. Once I allowed myself to admit I was truly still sad, things got easier. Once I no longer tried to act happier simply for the sake of other people, I actually began to feel genuinely happier. And then just when I thought I was coming out of things last week, work threw a real curveball at me. I got called to the principal's office. For real. There were some meetings where I offended some people. I stood up for the kids at our school who struggle with math and who I worry will be left to struggle on their own without the support that they need and while perhaps I stood up too loudly and too forcefully, I do not regret the things I said. Sadly, our administration didn't quite agree with me and I got called into the principal's office and ended up having to apologize for things I wasn't really sorry for. Had this happened last year, I would have kept fighting. Had this happened last year, I would never have apologized, but in that moment I just needed the whole thing to go away. I have worked so hard these past few weeks to get back to a good place and all of this with my administration was truly just dragging me right back down. And while I will never, ever, change the type of teacher that I am, I decided that it would be better for me to change the type of employee that I am (at least for now). And so, I made a decision that sort of made my heart break, I decided to just let go and worry instead only about the twenty-one precious children in my classroom. I am leaving the rest of the fight for someone else. As I said, a year ago, I could never have imagined saying those words, but there is simply too much other stress in my life to take on one more fight. So this week, I went back in to work and vowed to leave the fighting to someone else. I walked directly into my classroom early this morning and didn't leave for the rest of the day. My children made me smile in multiple ways and I was so happy to be back and focused on the people who are really important, my students. They allowed me to take those final steps back to happiness this morning. And by the end of the day, I actually felt rejuvenated instead of drained and exhausted. I felt hopeful instead of frustrated. I felt lucky instead of cheated. And all I can do for now is hold on to these good feelings for as long as they might last. Thursday night, I hit bottom. Literally. I fell down the stairs. I blame it on slippery socks and complete and utter exhaustion. I sat in a heap at the bottom of my stairs and cried. As Carla came running down the stairs to check on me, I truly felt like I just gave up in my heart. Well, there has been forward progress. I am no longer spontaneously erupting into tears (well, maybe, it almost happened once today, but I managed to stop the tears before they fell). I can feel things getting better, however I still find myself deeply entrenched in a pretty serious funk. It's hard. I want to return to my normal self. I want to be able to sleep through the night and not deal with the headaches I have had for the past week. I want to be able to not get frustrated by things easily. I want to be able to make it through a meeting without yelling at my administrators (okay, that might happen no matter what condition I was in). I want to just get over it and be okay. But, sadly, I haven't been able to. I find myself stuck in this place where I want to act like everything is okay because I know that is what people expect. But, at the same time, I am just not there and the more I pretend to be okay, the worse it seems to get. So I do what I tend to do best. I retreat. I don't answer phone calls. I don't reach out. I tend to walk into my classroom early in the morning and stay hidden safely inside of the walls of my room. I have been overwhelmed, as I often am, by the support from people in my life. The most unexpected people have reached out in the most wonderful ways. I wish people knew what a difference it makes. When I go to extreme measures to isolate myself, it makes a world of difference just to know people are still thinking of me and ready to provide help when I am ready to accept it. As I have said before, this journey would be much harder without the support of the incredible people in my life. But I guess that support can only do so much. I don't want to let people down. I don't want people to see that I am just not ready to be positive again quite yet. I don't want people to know that I am still just really sad. I know it's funny that I say I don't want people to know and yet I am writing it for all of you to see. So I guess what I really mean is that I don't really want to explain all those things. I just want to be all of those things. In a way, I guess this post is sort of my apology. I am sorry for not being much of a good time right now. I am sorry for not really carrying my weight at work or with my family or with my friends. I am sorry for not really being the Jess that I usually am. I like to think that I will get back there soon. I like to think that this headache of the past few days will go away and I will resume taking joy in the things that used to bring me joy. It is just going to take a few days. In the mean time, Carla and I are about to go vote. For tonight, I will hope for good things with this election. And then, perhaps after that, I will hope for good things in general. I'd like to spare you all the details. We had another no. This one was particularly hard because of the timing. We found out on Tuesday of last week that a mother had requested to see our profile. She requested us and three other couples. We decided to tell no one. We are starting to get how this whole process works and we are coming to realize that the fewer people we tell, the better. So the waiting began. Our profiles were given to the mother on Thursday. On Saturday night, I found out that my grandmother passed away. My heart instantly hurt for my mother, who has dealt so bravely with so much this past year and now had to deal with the loss of her mother. My heart hurt for my grandfather who loved my grandmother so very much and whose entire life purpose these past few years has been to take care of her. Theirs was the kind of love that made you believe that people really do love each other for entire lifetimes. And now he must find a way to live without her. I was so deeply saddened. I wanted to get on a plane the very next day to go and be with him and to be with my mom and to be with her family. But instead, I was waiting. I couldn't get on a plane without knowing what decision this mother would come to. I was so stuck. I didn't know what decision to make. And then my mother called and in her infinite kindness and wisdom, she told me that I was not to get on a plane until I knew what was happening. She reminded me that my grandmother was so excited that we were in the adoption process and she would have wanted me to stay even if there was only a small chance that this could be our child. My mother will never know how much those words meant to me. I decided to stay here in Chicago until I heard either way. On Tuesday we heard. It was a no. You would think that this would get easier. And in some ways it has. In some ways, knowing what to expect makes the no so much easier. In other ways, this was the hardest no yet. Wednesday was Halloween. An elementary school teacher's most difficult day. But I went to work. I allowed myself to get lost in the kids for the day. I cried a few times while they were out of the room and then I put a smile back on my face and made sure to make the day a good one for them. As usual, it was hard not to smile around them. We had a good day. We had a great party with parent volunteers who took care of every little thing. I somehow made it through the day and then came home and by the time Carla got home from work, I just sat on the couch and cried. I haven't really stopped since. Tomorrow, I will get on a plane and fly to Florida to be with my family. I so badly want to be able to put my sadness aside to help my mom and my grandfather to deal with their own sadness. One of the hardest parts of this process for me is that I don't really love the person that I am becoming. I kind of hate the sad version of me. I hate the jealous part of me who looks on Facebook and gets a little sad when I see that someone else is pregnant. I hate the mopey part of me that feels like doing nothing but sitting on the couch and eating the rest of the leftover Halloween candy. I hate the part of me that dropped my dog off at the "pet hotel" tonight and then got in the car and couldn't stop crying. I know I have to allow myself to be that person, but it doesn't stop me from disliking it. I try to always leave these posts with a smidge of positivity. I can't do it today. I know that I will feel better after this weekend. I know that this will all be worth it someday. But right now, in this moment, I am just kind of miserable.